Rosario Mazzeo's collection of more than 70 instruments, collected to illustrate the development of clarinet mechanisms, was donated to the NMM in 1995. Makers whose instruments are represented in the collection include Albert, Astor & Co., Berteling, Bertold & Sons, Boosey & Hawkes, Buffet, Chedeville, Conn, Couesnon, Golde, Grass, Graves & Co., Haynes, Huller, Key, Kohlert, Kruspe, Lacroix, Mahillon, Martin & Cie., McIntyre, Oehler, Peloubet, Penzel, Ramponi, Sauerhering, Selmer, Stengel, Stepansky, and Thibouville & Lamy. 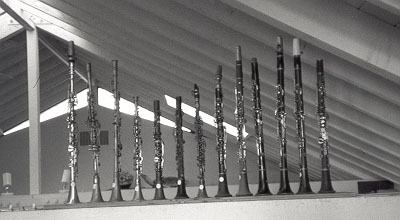 Some of Mazzeo's clarinets as they were displayed in the rafters of his Carmel, California home. 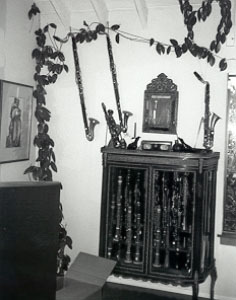 Rosario's clarinet collection was a prominent part of the living room decor in his beautiful home overlooking Monterey Bay. Some instruments were stored in cabinets, others mounted in the rafters. According to Deborah Check Reeves, Curator of Musical Instruments, "It was probably a short step from collecting numerous models of clarinets in various stages of development to questioning how the Boehm system could better serve its players. 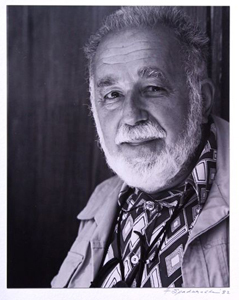 Thus an interest in developing and refining the Boehm system led Rosario ultimately to the development of his own 'system.' In 1959, Selmer of Paris manufactured the first Mazzeo system clarinets. 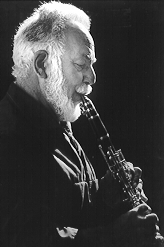 This is also the same year that Mazzeo published his Manual for the Mazzeo System Clarinet. Three patents were issued to Mazzeo for his clarinet key-mechanisms, in 1959, 1962 and 1965. In 1961, Mazzeo gave Selmer the exclusive license to manufacture Mazzeo system clarinets. Some 13,000 examples were produced." "One of Rosario's main concerns about the regular Boehm system clarinet was that the register vent was too large for the best upper register performance, yet too small to produce a rounded tone on throat B-flat. In his own words, 'Fundamentally what was sought was an improvement of the mechanism over the break of the clarinet to facilitate passage work and sonorities in the area of the break. Also, it was desired to make the sound of the B-flat equally sonorous with all of its neighbors, and not to induce embouchure manipulation which would, besides making for a general unevenness, induce degradations of sounds in this area when the B-flat was being played in conjunction with other notes. The solution as to sound was that the B-flat must be produced by its own vent hole--not the register key hole. This has the double advantage of producing a sonorous B-flat at the same time relegating the register hole to its own use as a speaker.' The awkward finger movements required by the throat B-flat also worked against a consistently good hand position and a steady grip on the instrument. Movement of the instrument, in turn, worked against the development of a firm embouchure. The Mazzeo system clarinet set about to eliminate these problems. With a new, properly tuned and full-tone side hole for third-line B-flat, many more fingerings became available for this note." "All the Mazzeo system models make use of a ringless bell that aids in weight reduction and balance of the instrument. All models utilize a plateau key for the left thumb. This is supposed to make for better matched tone quality with the surrounding notes, and eliminate the failure of covering both the hole and ring at once with the thumb." "Mazzeo's own clarinets, his own true personal models, were developed after Rosario retired from symphonic playing. In his own words, when he had 'time to think and putter, I began to develop the idea of a set of clarinets for me. No one else. My fingers. My hands. No shortcuts. No holds barred in thinking the problem through. No timetable.' The only set incorporating all of his innovations, which include a Buffet in B-flat, a Buffet in A, and a Selmer in B-flat (see photo at left), now have a permanent home at the NMM." "Rosario started with a standard Mazzeo system model. With the help of instrument technicians, initially Dennis Heaney of Santa Cruz and later Norman Benner of San Jose, the project took five years to complete. The result has been what Rosario refers to in his book, The Clarinet: Excellence and Artistry, as the 'Famous California Custom' clarinet." "Although the Mazzeo system clarinet is no longer manufactured, it is an excellent example of how the clarinet continued to evolve during the twentieth century. Perhaps it foreshadows the clarinet's continued development in the twenty-first." Excerpted from Deborah Check Reeves, "The Mazzeo System Clarinet: An Historical Review," The Clarinet (March 1999), pp. 62-64. Rosario Mazzeo (April 5, 1911-July 19, 1997) was a courtly gentleman for whom no day had enough hours for all the things that he wanted to do. Born April 5, 1911, in Pawtucket, Rhode Island, he moved with his family at age four to Worcester, Massachusetts, from where, as a teenager, he made weekly trips into Boston (sometimes walking!) to study clarinet with Jack Lynch. In 1928 he moved into Boson, washing dishes and working as a janitor to finance lessons, first with Gaston Hamelin, principal clarinet with the Boston Symphony, and then with Gustave Langenus of the New York Philharmonic, taking the overnight ferry to Long Island and returning by train. In 1933 he joined the Boston Symphony, playing E-flat clarinet for six years and bass clarinet for another twenty seven. He was also the Orchestra's personnel manager, a job that he assumed in 1942. In 1966, after "thirty-three truly happy years as a member of the BSO," Mazzeo moved to Carmel, California, with his wife, Katie Clare, who plays harpsichord and fortepiano. Also a serious photographer--he had his first one-man show at the Carl Siembab Gallery in Boston--Mazzeo's move to Carmel was influenced in part by the fact that Ansel Adams, with whom he had been close friends in Boston, was now living in the area. 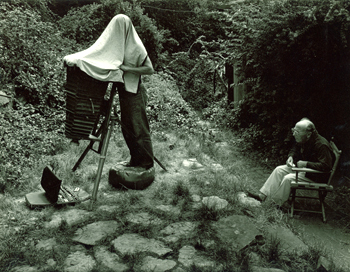 Mazzeo was also interested in ornithology and went on many expeditions to study and photograph birds. Excerpted from Andr� P. Larson, "It's Been 'The Year of the Clarinet;' Mazzeo and Maynard Collections Enhance Museum's Holdings," America's Shrine to Music Museum Newsletter, Vol. XXIV, No. 2 (January 1997), pp. 4-5. "A Tribute to Rosario Mazzeo," The Clarinet, Vol. 25, No. 2 (February/March 1998), pp. 40-46. Mazzeo, Rosario. "Clarinet Master Class," Selmer Bandwagon, 1967-1980s. Mazzeo, Rosario. The Clarinet: Excellence and Artistry. Sherman Oaks, California: Alfred Publishing Co., 1981. Mazzeo, Rosario. "The History of the Clarinet's B-flat Mechanisms," The Clarinet, Vol. 7, No. 2 (Winter 1980), pp. 6-9, 33-37. Mazzeo, Rosario. Manual for the Mazzeo System Clarinet. Philadelphia: Henri Elkan Music Publisher, 1959. Mazzeo, Rosario. "Mazzeo Musings," The Clarinet, Vol. 13 (Fall 1986)-Vol. 21, No. 4 (July/August 1994). "Selmer Mazzeo System Clarinets," advertising flyer. Elkhart, Indiana: Selmer Division of the Magnavox Co., 1971. A selection of instruments from the Rosario Mazzeo Collection are on display at the NMM. Others are available for examination by appointment (see access guidelines) in the NMM's study-storage areas. Go to Annotated Checklist of Mazzeo System Clarinets.